The story of Thomas Smith is important to our family because he was the first Smith to live at Blackhall, County Meath. He is not a direct ancestor of ours but he was my grandfather’s Uncle Thomas from whom – we were told – he inherited Blackhall. Thomas Smith was born in Gamblesby, Cumberland, on 9 April 1833. He was living with his parents and six of his brothers and sisters in June 1841 when the English census was taken. In the March 1851 census he was living with his parents and two sisters in Sowerby Row, Cumberland, on a rented farm. I believe he moved to Ireland with most of his family in 1852 or 1853 and lived on a rented farm at Rathcoun townland near Cashel, County Tipperary. Thomas would have been 19 or 20 years old when he arrived in Ireland. His older brother Lancelot Smith and he would have been the key to making their move to Tipperary a financial success. There were six other family members (their parents and four sisters) depending on them. I don’t know how long Thomas stayed in Tipperary but I have an idea that, early on, he started to deal in livestock. I think he developed contacts with farmers in Tipperary and was able to make money by selling livestock in the Dublin market, among other places. Having done this for about ten years, I think Thomas was then able to afford to rent Blackhall and use that farm as a convenient location for animal grazing, close to Dublin. Several years after he took over at Blackhall, I believe Thomas started the firm Smith, Griffin to conduct cattle sales in the Dublin market. This is largely speculation at present although I do have some information to support my ideas. I am continuing to look for more and better information that would support (or contradict) my assumptions. 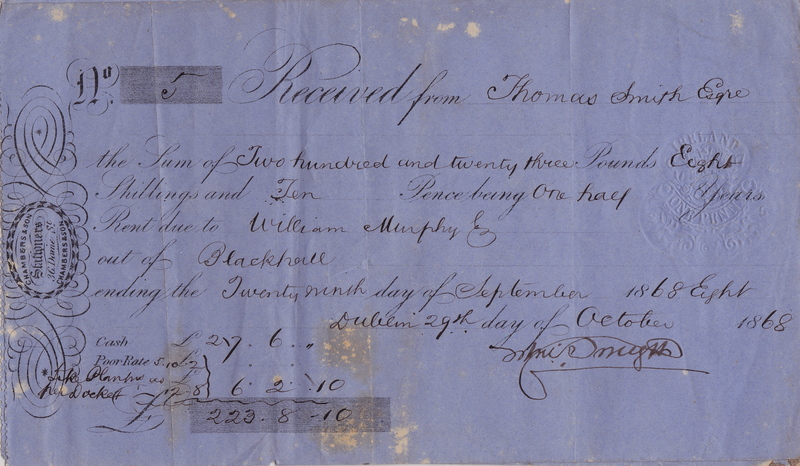 However it came about, Thomas was able to rent Blackhall house and lands starting on 2 April 1863. The house at Blackhall and the surrounding farmland are in the townland of Blackhall Big in the civil parish of Ballymaglassan, County Meath. 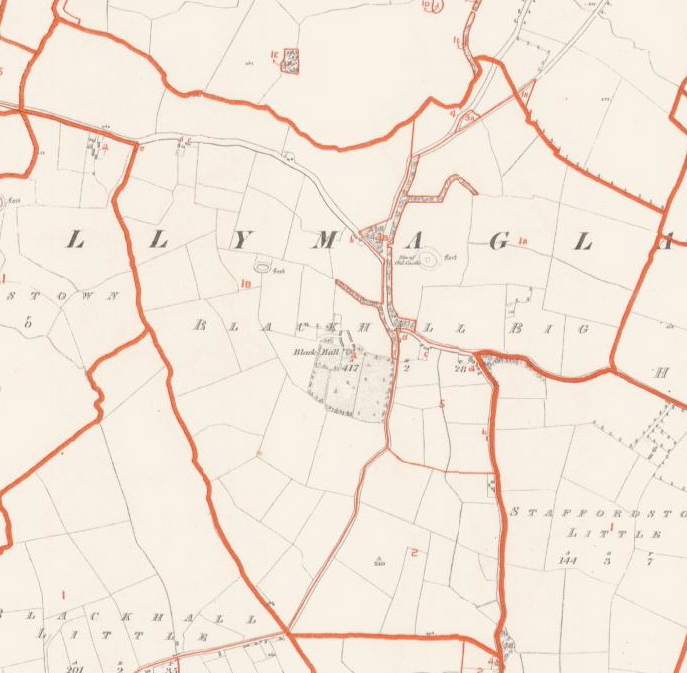 In 1854, when Griffith’s Valuation was conducted in County Meath, most of the Blackhall Big townland – and the nearby townlands of Ballymaglassan and Growtown – was in an estate owned by the Murphy family, then headed by James Murphy. Copyright 2003 of OMS Services Ltd, Eneclann Ltd and the National Library of Ireland. Between 1864 and 1868 the half-year’s rent payment had gone from £194 6s 0d to £223 8s 10d (including Poor Rate). The second rate remained the same for many years. 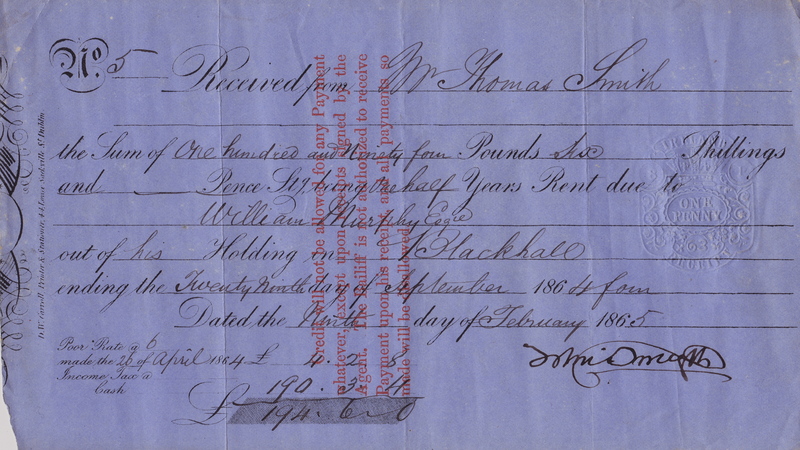 To put this rental cost in perspective, in 1864 Thomas sold livestock, oats, wool and sundry other items for a total farm income of £2,584 1s 8½d. This information comes from a farm account book that Thomas kept for about two years starting just before he took possession of Blackhall. I will be writing some posts about the information that can be found in his farm accounts. When Thomas Smith moved into Blackhall, he seems to have become involved very quickly in the small Anglican (Church of Ireland) community in the Parish of Ballymaglasson. In March 1864, Thomas was appointed as one of two church wardens for the Church of St. Keiran. A few months later, in July, there was a re-arrangement of the church pews required because the Parish of Rathbeggan was absorbed into Ballymaglasson; in the re-arrangement, Thomas Smith was assigned a single enclosed pew. Thomas continued to be a church warden until 1870 when the Church of Ireland was disestablished and a select vestry was set up starting in January 1871. At that point, Thomas Smith was appointed to the select vestry and was also appointed as one of four men to manage a Parochial Fund newly required for the support of the church (due to the loss of tithe income). Thomas continued to be a member of the select vestry until he died. Thomas’s involvement with the Anglican Church is interesting because it seems that at the same time in the early 1870s, in Donabate, Thomas’s brother Lancelot was limiting his involvement in the local Anglican parish and maintaining his links with the Wesleyan Methodists. Both the Smith brothers were generous in providing donations to support their local Anglican parish. Thomas did not live alone at Blackhall. He would have needed at least a housekeeper and I believe his sister Mary provided that support for the first few years. Mary was living at Blackhall when she married Thomas Bouskill in 1866. Probably Thomas’s sister Sarah then took over the housekeeper duties for him. She was certainly living at Blackhall in 1871 when their father died in Grange, County Tipperary. Unfortunately, on 5 March 1873, Thomas Smith died at Blackhall aged 39. According to a magazine article from 1955, Thomas died from pneumonia caught while he was working on installing drains on the farm. He was buried at Mount Jerome Cemetery in Dublin. Perhaps surprisingly, Thomas left no will although he had significant assets. Without a will, his nearest relative would inherit as the “heir at law”; that was his older brother Lancelot. 27 August Letters of Administration of the personal estate of Thomas Smith of Blackhall County Meath Farmer a Bachelor deceased who died 5 March 1873 at same place were granted at the Principal Registry to Lancelot Smith of Corballis Donabate County Dublin Farmer the Brother of said deceased. Effects under £3,000. This referred to Thomas’s personal estate and not to any real property or businesses he owned. We know he did not own Blackhall but he did have a strong lease to the house and land there. 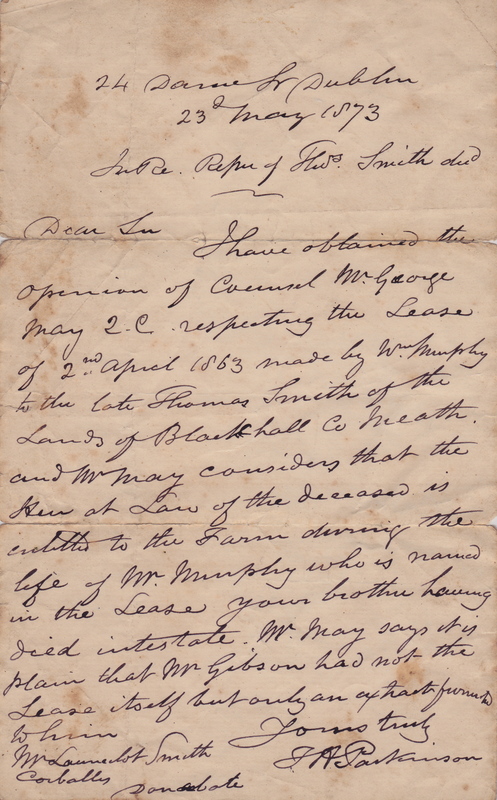 We don’t have a copy of the original lease but we do have a useful letter written in May 1873. The validity of Thomas Smith’s lease of Blackhall was confirmed in a lawyer’s letter to Lancelot Smith after his brother Thomas had died and someone else had tried to acquire a lease for Blackhall. Aside from the lease on Blackhall, I believe Thomas had other business assets in a livestock sales and wool factoring business under the name of Smith, Griffin, and Co.
Lancelot Smith must have kept the Smith, Griffin business of cattle sales and wool factoring running, as well as managing the farms at Blackhall and Corballis. The business known as Smith, Griffin & Co. continued to belong to the Smiths until the 1960s. 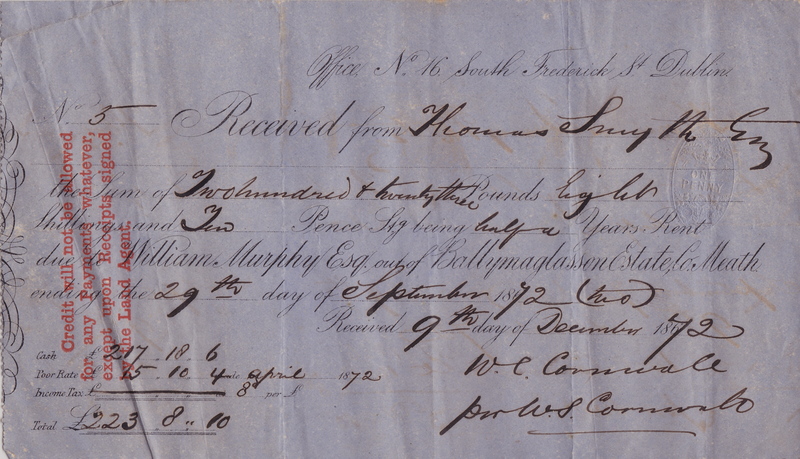 Rent receipts for the Blackhall farm show that, in June 1874, the “Reps of Thomas Smith per Mr. Lancelot Smyth” paid the half-year rent owed of £223 8s 10d to William Murphy of Ballymaglass0n Estate. “L Smith Esq., Rep of Thomas”, was still paying the rent in February 1879. 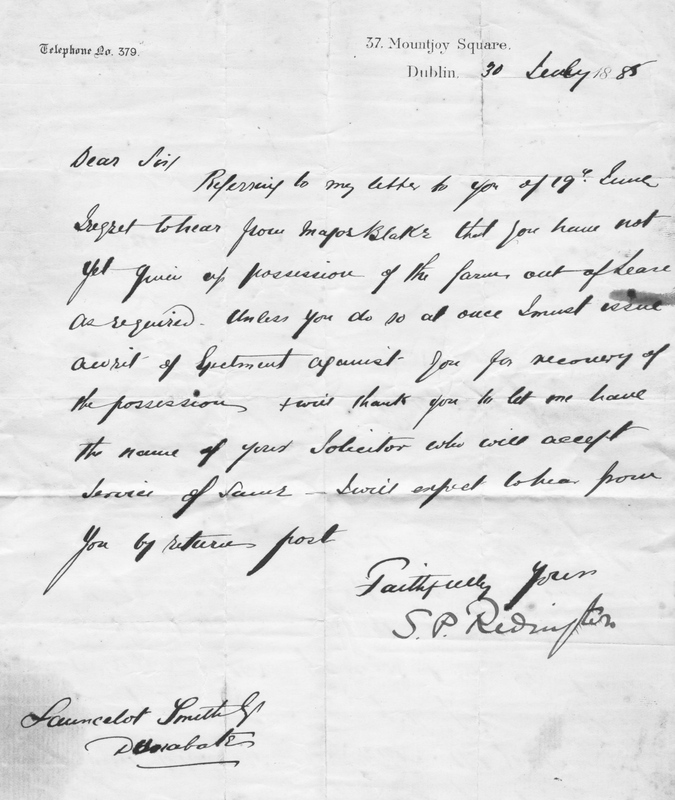 In July 1885, an agent – probably a lawyer – for the Ballymaglasson Estate sent a letter to Lancelot Smith saying the farm at Blackhall was now “out of lease” and he must give up possession or have a writ issued against him. This meant that William Murphy had died and the lease had expired. William Murphy’s heir was William Brudinal (or Brudenell) Murphy. In order to keep renting the Blackhall property, a new lease would be required between Lancelot Smith and the new landlord. No other letters were found on this subject. 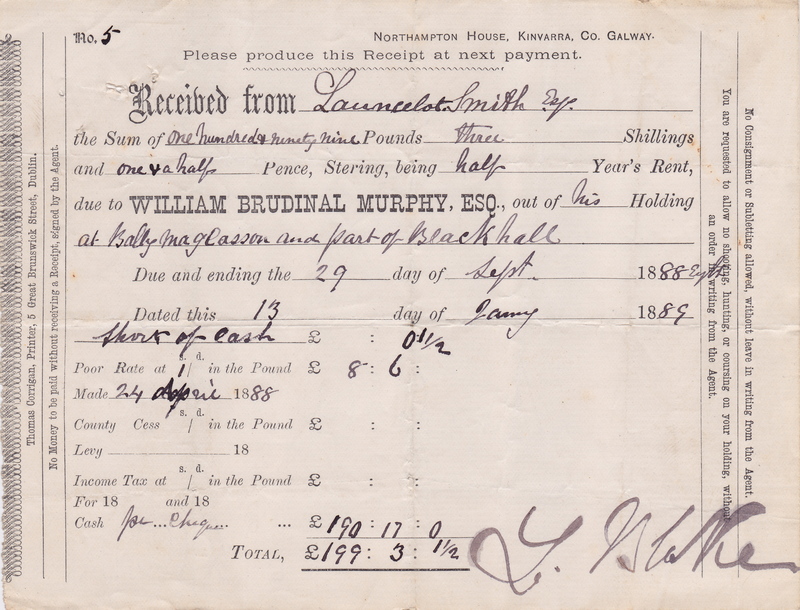 A new lease must have been signed between Lancelot Smith and William Brudinal Murphy because we have later rent receipts. The first one we have under the new lease is dated January 1889 and covers a half-year’s rent up to 29 September 1888. The rent was now reduced to £199 3s 1½d and continued at that rate until 1901. In March 1889 Lancelot Smith applied for a loan of £150 from the Commissioners of Public Works to improve the “lands of Blackhall Big”. By 1895, Lancelot Smith’s son William had taken over management of the Blackhall farm from his father. Despite his early death, Thomas’s life was significant because he acquired the Smiths’ first lease on Blackhall house and lands in 1863. From that action, Thomas indirectly enabled his nephew William Smith to start his career as a farmer at Blackhall in the 1890s. This entry was posted in Blackhall, Smith, Tipperary and tagged Blackhall, Thomas Smith. Bookmark the permalink.